My wife Janet and I always cringe at a new parish when it comes time for the Our Father. We quickly bow our heads and close our eyes; I clutch my hands close to my chest (and she does the same) and we start to pray — hoping some aggressive hand-holder doesn’t reach over and insist on tearing my hands apart so I can warmly hold theirs during the prayer. Karl Keating has a few things to say about hand-holding at Mass which I produce here for others who close their eyes and clutch their hands close to their chests. My long-time sense had been that hand-holding at the Our Father was an intrusion from charismaticism, but I had not been aware of the possible connection with AA. If this is the real origin of the practice, it makes it doubly odd: first, because hand-holding intrudes a false air of chumminess into the Mass (and undercuts the immediately-following sign of peace), and second, because modifications to liturgical rites ought to arise organically and not be borrowed from secular self-help groups. As a member of AA for 33 years I can attest to the fact that hand holding at Mass did not come from AA. Prior to the establishment of “re-habs” AA members never held hands. This was a custom that started in re-habs and filtered into AA meetings. In recent years, many, many AA groups have done away with hand holding during the recital of The Our Father. In keeping with tradition six of our Twelve Traditions, “An AA group ought never endorse, finance or lend the AA name to any related facility or outside enterprise, lest problems of money, property and prestige divert us from our primary purpose.” ie; to help the suffering alcoholic. We do not endorse re-habs, ergo, the same applies to their custom of hand holding. Too bad the Church doesn’t clarify or uphold its own traditions. This custom at Mass was most likely brought in by charismatic groups. PS; I do not hold hands at Mass! I was led back to the church through AA. The spiritual relativism that goes on in there squeezed me away and the absolute disdain for any mention of Christ kept me out. AA is a program that uses Catholic spiritual practices and calls them their own. It’s a self perpetuating cult and any resemblance to them is scary! The founder of AA had a very good friend (sponsor) by the name of Fr. Ed Dowling. He never converted because he loved his new organization more than Christ. Bad stuff! If you don’t transcend through a 12 step program into the church, you’re way off base because 12 step programs are the space filled by a void of the church. They’ll just never tell you that and they’ll shun you for saying so. ? We had a bishop institute it in our diocese in the mid 90’s. I have never liked it and I have always had other opportunities to hold the hands of my family. Over the years it has caused many uncomfortable situations that should not be a part of the liturgy and can be the cause of a near occasion of sin. That bishop also instituted TM,yoga and enneagrams. Though I did not participate in any of those activities, I felt the need to obey the directive of the bishop.Then I found that it was not called for in liturgical norms, so I felt comfortable with avoiding it as much as possible. So, in the interest of charity, I would go along if it might seem like a rebuff to my neighbor. Now I am doing what you do, Steve, It is much better for me and I have never been reprimanded by a priest for not holding hands. You are doing great work for the Lord, may He continue to bless you richly! I say nothing like sharing a moment of togetherness with fellow Christians like holding hands during “Our Father” (see not “my” Father!). Having said that, I also respect others who prefer to remain very private. Last time that I visited a small local “rural” church here, I was very touched when a young lady stranger extended her hand to me. That was me when I was younger, more idealistic and took the gospel in its simplest form! These days, I will admit that I only normally hold hands with my spouse and family member. But I’m so delighted when I see my (now adult and married) children passing on this tradition by holding hands with their own children now. I know that many very devote people do not like the hand holding. However, I think that you can do with the flow. I have no problem is someone reaches out to me. I don’t hand hold, even with my family. I reluctantly acknowledge the “sign of peace” but see little point in it. After all, I’m not at war with anyone at the mass. Sometimes, quiet tradition simply speaks for itself. There is no rubric with regard to the Lord’s Prayer beyond standing. Some believe that unless the rubrics give an all inclusive direction, no possibility for the development of local customs like joining hands in a clear expression of unity. Rubrics lay down general norms but they are not intended to be a straight jacket. There is no rubric directing clergy to automatically go to the tabernacle at the time for communion, but the GIRM clearly explains that the faithful have a right to receive Communion that was consecrated at each particular Mass. the same General Instruction states that the celebrant ought to include in the hosts to be consecrated a larger one that can be broken into pieces so that at least some members may receive from the “One Bread”. Yet many priests and bishops continue to consecrate their own personal host that traces its origins to the time when the celebration of private Masses was the norm. Joining hands at the Lord’s Prayer has become an important practice for countless Catholics. It does not make of them rubric violators or progressive loons. The idea of well informed Catholics cringing at the practice is, for me, very distasteful and, frankly, uncharitable. Thank you for your kind but firm approach to the nuisance of hand-holding. I simply place my hands together in a Durer-esque fashion, close my eyes, and try to look holy (okay, it’s a stretch). Holding hands is for family only, and, no, the sappy “we are church / we are family” thing won’t work. Holding hands during the Our Father is a gesture of love that helps bring people together as the body of Christ. Since official documents do not specify a gesture nor prohibit holding hands, be not afraid of it. I wonder what is really fueling this controversy. I am also uncomfortable with landholding during the Our Father. However blatantly excising oneself from the community when a hand is offered does seem to run the risk of replacing , “Our” with MINE. Holding hands may have good intentions, but I notice the comments and practice is usually “I” centered instead of Christ-centered and following his will as led by the church rubrics. Nothing is usually mentioned about wanting to follow the rubrics….just what “I” want or feel like. Let’s pray for us all to do God’s will. I think everyone’s individual preference should be honored. There are many reasons for people not wanting to hold hands and the nun spoken of above should be made aware of it. Cancer patients undergoing treatment should never hold hands with anyone but especially strangers. People who have colds or allergies that compromises the immune system should not hold hands. During flu season no one should hold hands. But besides all these valued reasons if someone next to me has already folded their hands in prayer I never bother them and respect that. The only time since my husbands death that I hold hands is with my family and with close friends. Personally I don’t care for the hand holding and believe that the time for greeting should be at the sign of peace and not during the Our Father. 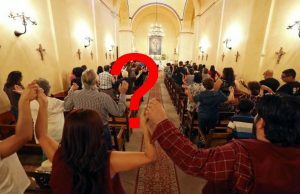 While we were visiting a parish in the Diocese of Phoenix the pastor announced before Mass that it was not proper to hold hands during the Our Father prayer. He said the proper thing to do would be to put our hands together as in prayer during the Our Father. I have found that if I do this shortly before the prayer starts that people get the hint and don’t expect me to hold their hand. While we were visiting a church in the Diocese of Phoenix the pastor announced before Mass that it was not proper to hold hands during the Our Father. The proper thing to do would be to put our own hands together as in prayer. I have found that if I do this shortly before the Our Father begins people get the hint and do not force me to hold onto their hand. Considering I cough and sneeze in my hands I hardly think I would hold hands with anyone in church. I do not hold hands during the Our Father. Holding hands is NOT part of the mass and is certainly out of place. For the rare occasions I go to the OF, my hands stay in front of me and those around me respect my desire not to hold hands. Our priests are missionaries from India. They politely asked us to stop holding hands during the Our Father, with the reason being that it’s not part of the rubrics. Thank God, and God bless them. It always drove me up the wall, and I had to do it anyway because my wife likes it. I explained that I don’t like it, but that never held water with her. The pastor’s opinion, however, she respects, even though the reason he gave is the exact same one that I gave. I can finally lift my hands in prayer and pray in peace without worrying bout offending my wife and having my daughter yanking on my other arm while I am trying to pray. And I gladly shake hands with those around me during the sign of peace– an appropriate point in the mass for such a gesture. The flagrant picking of ones nose, sneezing or coughing into ones hands are all guaranteed to discourage the hand holders. Just a quick note. WE all respect each others being…Steve the author is trying to be a staunch old school authoritarian when it comes to Holdin Hands!!! Oh my gosh Lord forgive us if we accidentally touch someone at Mass. Smile and enjoy the mass. STEVE RAY HERE: I can’t help but feel Mr Listi likes being contrarian. I am no old school contrarian since I was never in the Church in the “old school days” and anyone who knows me knows I am one of the most outgoing, hugging and fun person. I LOVE sharing the Sign of Peace with hugs, the shaking of hands and smile. Get over it Mr. Listi – some people just like things done right and are not as grouchy as you appear to be. I wonder if the apostle John dared to hold Our Lady’s hand as they watched our poor Lord expire on the cross? He better not have! I know many devout people who hold hands for the Our Father. I know a few rather pinched, self-righteous people who will not. They have their freedom to do so. As we always chant the prayer; their silence and tight lipped disdain make their position quite clear. So we leave them alone. Thankfully, they are usually visiting tourists and a tiny minority of our 1400 family parish which has maintained perpetual adoration for over 35 years. I find the practice distracting. In our area, the holding hands has morphed into people raising their arms into the air, and adding all kinds of extra gestures during the Mass. For those who don’t feel comfortable doing this, it just adds an element of stress to the Mass. If you choose not to, it can be an awkward moment if someone is grabbing for your hand, so you’re not fully engaged in the prayer. In addition, during the winter, when the flu is rampant, it’s probably not wise to be holding hands with people who may have coughed or sneezed into their hands a couple minutes before, and if you have a bug, you shouldn’t have to explain to everyone around you why you don’t want to touch them. I’ve also experienced when traveling, you go to a Catholic church, and you don’t know what you will get. We’ve experienced being asked to introduce yourself to the people sitting around you, which is not really why we are going to Mass. When you treat the Mass like a social gathering, you find that people tend to behave in a less reverent manner, and they start conversing in the pews like they’re at a coffee house. From reading all the replies, it seems to me that those who like to hold hands do so, and those who don’t (for whatever their reason) are being viewed as “pinched”, with one snarky comment even dragging the Blessed Mother and John into the ruckus. Meanwhile, the priests, either commenting here or mentioned here, seem to be on the fence as well. Some will say since it isn’t disallowed you can do it; with others contend that since it isn’t specifically mentioned you shouldn’t. As for what is ‘really fueling this controversy’ I believe it is the reality that it is not a universal posture and some people (for whatever their reason) don’t care that it has been recently added and don’t want to be forced to it by others; either sideways glance or a snatched hand. How about this? If you and/or your parish do it and you are comfortable with it carry on. If however, in that same parish or any one you visit, you see others prayerfully taking a different posture, don’t insist they take your hand. And, please, don’t read anything it to it except the fact that they are praying in an acceptable manner in the way they see fit. My husband and son hold hands during the Our Father and I assure there are no more devout Catholics than we are and understand clearly how to respect the dignity of the mass. I do not insist that others around us hold hands. My question about the way people raise their hands at the end of the prayer is if this is permissible? I would also like to comment of the way people laugh out loud during the mass at comments the priest makes. To me this is much more disrespectful than holding hands. I do not understand what is required for “Moderation”? Please explain. So not a huggy-feely hand sharing guy when I’m praying in the congregation. And don’t even get me started on those folks who insist on nearly shouting out “…GOD’s Holy Church…” where “…HIS Holy Church…” is called for. Politics should remain outside the doors. I guess I’ll never understand the need for those to take something as seemingly innocuous as hand holding during prayer and make it into…well,..this. I have seen many more things during Mass in recent years that really do warrant more discussion which I won’t go into here, because I don’t think any of these things are new, it’s just something to complain about. I remember I was surprised to see people holding hands during the Our Father, or raising hands and “praying over” a particular group of confirmandi or couples celebrating an anniversary. These were not things that I grew up doing and it was odd – I really didn’t know what to think; I even asked my priest about it..saying how I was surprised at all the “changes” in the Church – his answer? First he said – How old are you? You don’t seem old enough to remember Vatican 2. ( He was right. I was born in 1975 – so it put my use of “changes” into perspective. It’s not like I had to re-learn or get used to a radically different form of the Mass) Then he said – If you really feel that strongly about offering your hand for peace or prayer then just don’t do it. This part of the answer made me feel foolish and maybe a little petty – after all what were they asking? To reach out and offer my hand as a sign of our community – our belonging, as neighbors, to the same wonderful and perfect truth that is our faith. As far as “doing things right” – how would the early church fathers judge this generation of Christians, would they think we’re doing it “wrong?” Holding hands is not an act that contradicts the truth of our Lord’s teaching – so what harm is it? I mean isn’t that the argument I hear from various apologists on Catholic radio? No, a tradition may not be specifically mentioned in Scripture, but it’s not in conflict with our Lord’s teaching – ok – can this argument not apply here? Some naysayers say it’s distracting. Are they any less distracted by babies and children who may fuss a bit during Mass? Or constant (and sometimes profane, I’ve heard it myself) commentary from those around you? If holding your own family member’s hand is taking away from your worship, then maybe we have completely missed the point of meeting as a community to worship God who created the institution of family to begin with. Everyone is entitled to their opinions about the state of our Church or the seemingly high level of laxity in structure in the order of the Mass – but in an age of increasing self-inflicted isolation due to abuse of technology maybe an occasional handshake or handheld prayer isn’t such a bad idea. Have a Blessed Christmas all! I will even add – I have been to Mass in different places around the world, while I was in the Navy – I received ashes on Ash Wednesday while in a war zone from a non-English speaking priest – as a matter of fact there were only 4 of us in the room and I was the only one who spoke English. This priest did something I felt strange about – he handed me the Gospel reading in English (printed on paper) and asked me to read it. Now this wasn’t a Mass, it was just a distribution of ashes, and whether I was “authorized” to read it or not _ I saw it as a gesture of community, of a common bond of a small group of Catholics serving in a remote location in a Muslim country. The sad thing? I have never felt that same sense of community in my own country, in my own parish. Before I left he gave me a beautiful prayer card with a holy medal – didn’t say a word, just put it in my hand. I still have it – it reminds me of that time I actually felt I belonged. You never know how a single gesture can color someone’s experience. Maybe if holding hands is not your thing, a smile or nod could have that same affect and still let someone know you don’t feel uncomfortable with physical contact without making that other person feel silly for offering an extended hand. I grew up not holding hands during the Our Father. Feel comfortable with clasping my hands in a prayer like fashion during that prayer. Don’t extend my hands at “with your spirit,” and I give the sign of peace but would be happy if my pastor cut that part out. This is just what I do. I hold hands sometimes, if people are reaching out, but I very much appreciated the priest we had for a year who taught us about the mass during mass. He would sometimes stop to explain a particular prayer or a particular ritual before going on to say or do that prayer or ritual. On time he asked us why we held hands during the Our Father. A bold soul spoke of community. He mentioned the sign of peace, explained how the hand-holding was sometimes a distraction as people were finishing moving over and taking hands as we were praying “give us this day our daily bread”. The first part of the prayer was getting lost. So he encouraged us to not lose the first part of the prayer, focus on God, and if we still wanted to hold hands that was fine, as long as we understood the most important part was coming before our Father. I’m an older lady, and cling to the old-school New England ways I learned as a child. Holding hands with strangers – even in church – is very uncomfortable for many people like me. Contemplating the idea of attempting to psychoanalyze strangers on the internet so as to understand why they would want to hold hands, is also uncomfortable. And being psychoanalyzed by random, amateur strangers on the internet is also uncomfortable. Look. People like to do what they like to do. If they’re not breaking any laws or hurting anyone, try to be at peace with other peoples’ choices. If they want to hold hands, that should be OK with you. No skin off your nose. And if they don’t want to hold hands, that’s OK, too. No one should feel forced to hold hands with a stranger. (As if we want to introduce fascism into the Mass. “Ve haf vays of making you hold hands!”) Hand-holders, please have the class and the dignity to respect others who are giving off the obvious signal that they don’t wish to hold hands. And non-hand-holders, please communicate your preference to your neighbor in a gentle and friendly manner. Thank you. I don’t believe this. We have priests (all encompassing) abusing kids, seminarians, and anyone else they can get their “hands” on and this issue is contentious. God have mercy, they’re holding hands. I personally do not hold hands during the Our Father prayer. My focus during the Mass is directed to our Lord. The Eucharistic Prayer is my “high point” of the Mass… as the Holy Eucharist is the “source and summit” of our faith. I carefully follow the Eucharistic prayer as the priest prays the prayer and then afterward respond with the Great Amen. The Our Father is my internal response to God. I pray with my hands folded and head bowed. Hand holding would be distracting, whereas this is a time to be internally focused on God, as our Father. The communal aspect comes with the sign of peace and then individually receiving holy communion as a community. I have only been in the Church just over 3 years and am beginning to understand why Catholics are viewed with much skepticism. We worry over bells and whistles, icons, Latin/local language, don’t whisper to your pew mate, etc cetera. People we should all be On Our Knees when we pray. You can go to the same church for years and not know the names of 10 people that attend church with you. This is simply not a picture of a “Church Fully Alive”. How are we a Church Family when we don’t even know or care about each other enough to get to know each other. Faith is not the building you step inside or the pictures/statues, please quit being so hung up on the externals and get down on your knees and wash the feet of Jesus literally and spiritually. In a way, handholding brought me to the Catholic Church. I am incredibly repulsed at even the thought of touching hands with another person. At certain points in my life, I think it has verged on a type of mental illness. At the evangelical churches I was raised in, shaking hands and handholding was forced on me. I would spend most of the week dreading the coming Sunday’s 15 minutes’ of hand grabbing. Eventually, I stopped going to church. A Catholic friend told me at her church they just had to shake hands with the people sitting next to them and it was over in a few seconds. I decided to give it a try. I’m very happy in my parish where I don’t have to hold hands with anyone and I don’t usually even have to shake hands with anyone. Other people respect my folded hands and don’t grab at me. I think it is weird when others choose to hold hands during the Our Father, but I’m not bothered by it as long as they don’t force me into it. I spend most of my time in the choir loft during Mass. As often as I can, I turn and face the body of the church instead of the organ or choir. If the OF is not sung, it is easy to do that. What I often see during the OF is a complete distraction from the actual words of the prayer. It becomes these little islands of battles and isolation, where some are left out or worse, forced to hold hands. With school kids, it becomes a grip contest. During outbreaks of the cold and flu, it becomes awkward as those normally open to hand holding have to explain why they no longer want to. Then there’s also the ‘at what angle’ battle, where some want to hold upright, and some want to hold slack or down. Oh, and also the ‘how long’ battle – some hold all the way to the Sign of Peace. The ‘orans’ posture of prayer isn’t a hand holding offer. The Sign of Peace is the time for hand-holding. Oh ya, and there’s also the ‘how far do we stretch’ battle, to include or not include, to offer or not to offer, to a person farther down the pew. All are distractions from what the prayer intends. It is addressed to the FATHER. Don’t make it about hand-holding. I pray the words with so much more attention to their meaning when I am not distracted by the whole hand-holding issue. My practice with my husband, if I am in the pew beside him is to stand shoulder to shoulder and very discretely lock fingers and only til the end of the actual OF. 112. QUERY 2: In some places there is a current practice whereby those taking part in the Mass replace the giving of the sign of peace at the deacon’s invitation by holding hands during the singing of the Lord’s Prayer. Is this acceptable? REPLY: The prolonged holding of hands is of itself a sign of communion rather than of peace. Further, it is a liturgical gesture introduced spontaneously but on personal initiative; it is not in the rubrics [cf SC 22.3: “no one on their own authority, not even a priest, may add, change or omit anything in the Liturgy, my emphasis and addition]. Nor is there any clear explanation of why the sign of peace at the invitation: “Let us offer each other the sign of peace” should be supplanted in order to bring a different gesture with less meaning into another part of the Mass: the sign of peace is filled with meaning, graciousness, and Christian inspiration. Any substitution for it must be repudiated: Not 11 (1975) 226. In the loving obedience we do not add, change or omit anything in the Divine Liturgy or we make, especially the Priest as Alter Christus, a disobedient sinner – the heart and soul of our Redemption is the Loving Obedience of Jesus Christ by which we have been reconciled to the Father – we cannot, especially the Priest, or deacon, “make Jesus LIKE us in everything, including sin and doing our will and not the Fathers. Also recall that the Lord repeatedly command Moses and the People to make and do everything in the Liturgy as shown and commanded, and ‘not to turn to the left or right’ ‘but do exactly as Revealed and Established. Even Canon Law witnesses that we are to lovingly obey all the rubrics and celebrate the Liturgy as Divinely established. 31. In keeping with the solemn promises that they have made in the rite of Sacred Ordination and renewed each year in the Mass of the Chrism, let Priests celebrate “devoutly and faithfully the mysteries of Christ for the praise of God and the sanctification of the Christian people, according to the tradition of the Church, especially in the Eucharistic Sacrifice and in the Sacrament of Reconciliation”.71 They ought not to detract from the profound meaning of their own ministry by corrupting the liturgical celebration either through alteration or omission, or through arbitrary additions.72 For as St. Ambrose said, “It is not in herself . . . but in us that the Church is injured. Let us take care so that our own failure may not cause injury to the Church”.73 Let the Church of God not be injured, then, by Priests who have so solemnly dedicated themselves to the ministry. Indeed, under the Bishop’s authority let them faithfully seek to prevent others as well from committing this type of distortion. Blessings of the Beloved with Our Lady through Saint Peter on his feast day!! Thanks PadrePF, most helpful. Thanks for sharing it! One of the (many) reasons I stopped attending the Catholic Church. Unfortunately, I am faced with the dilemma when attending a wedding or funeral. The shaking of hands and the hands across the aisle repulse me. I don't know these people and have no interest in them. STEVE RAY HERE: I don’t mean to be uncharitable but that is one of the flimsiest reasons I have ever heard for leaving the Catholic Church. I don’t like the handholding but I am sure not wanting to stand before God and say, “I left your Church because I didn’t care for all those people of yours and did not want them to shake my hand.” Yikes!